Britain’s Golden Age of illustration, the illustration of children’s literature in particular, was ushered in, at least in part, by Japonism. Other factors contributed to the flourishing of children’s literature adorned with exquisite illustrations, but the beauty of the Japanese prints that flooded Europe after the Sakoku period elevated the status of illustrators whose art was engraved and printed. Moreover, the illustration of children’s literature allowed and sometimes required substantial creativity on the part of illustrators. For instance, as discussed in a previous post, Lewis Carroll’s Alice’s Adventures in Wonderland (1865) and its sequel, Through the Looking-Glass (1871), featured literary nonsense. I will also refer to the curvilinear and very popular and influential Art Nouveau. British illustrator Aubrey Beardsley (21 August 1872 – 16 March 1898; aged 25) is a representative of the style, but Art Nouveau is usually associated with Czech artist Alfons Mucha. It is a characteristic of art produced in the last decade of the 19th century and in the years preceding World War I. For instance, the sideboard shown below, designed in the Anglo-Japanese style by Arthur William Godwin (26 May 1833 – 6 October 1886), cannot be considered “conventional”. 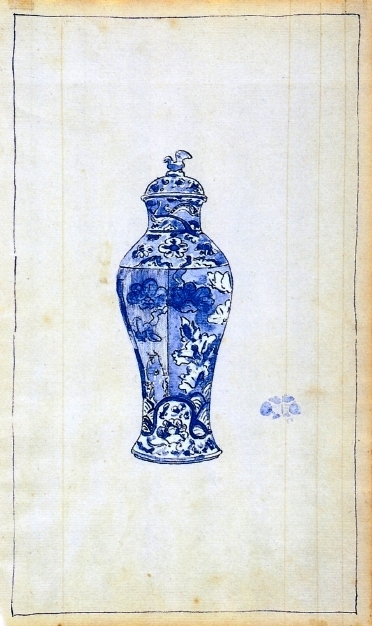 It may reflect Japanese furniture, but it is also consistent with the concept of art for art’s sake, l’art pour l’art, advocated by French poet Théophile Gautier (30 August 1811 – 23 October 1872) and shared by certain members of the Aesthetic Movement, such as James Abbott McNeil Whistler. Yet, as noted above, the Anglo-Japanese style is partly rooted in the creed of members of the Pre-Raphaelite Brotherhood. It is innovative, Charles Baudelaire‘s “du nouveau,” newness. The movement was called brotherhood, which could suggest equality and fraternity, but members of the brotherhood were brothers in that they rejected Sir Joshua Reynolds, (16 July 1723 -23 February 1792), renamed Sir ‘Sloshua’, the founder of the English Royal Academy of Arts. Pre-Raphaelites also wished to return to the art preceding the High Renaissance paintings of Raphael (6 April or 28 March 1483 – 6 April 1520). It would be joined by other artists. The Aesthetic Movement promoted the concept of art for art’s sake, l’art pour l’art. Consequently, there are affinities between the Pre-Raphaelite Brotherhood and the Aesthetic Movement. They may differ however in that the Pre-Raphaelites “continued to accept the concepts of history painting, mimesis, imitation of nature as central to the purpose of art.” This could explain why John Ruskin (8 February 1819 – 20 January 1900) praised the movement (see 5). He advocated “truth to nature”. 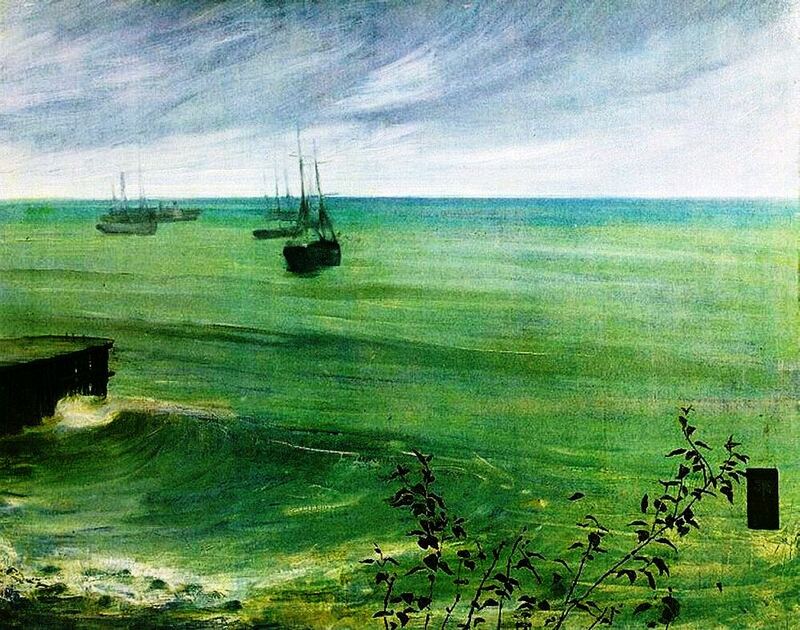 For Ruskin “truth to nature” did not seem consistent with the allusive nature of McNeill’s Impressionism. 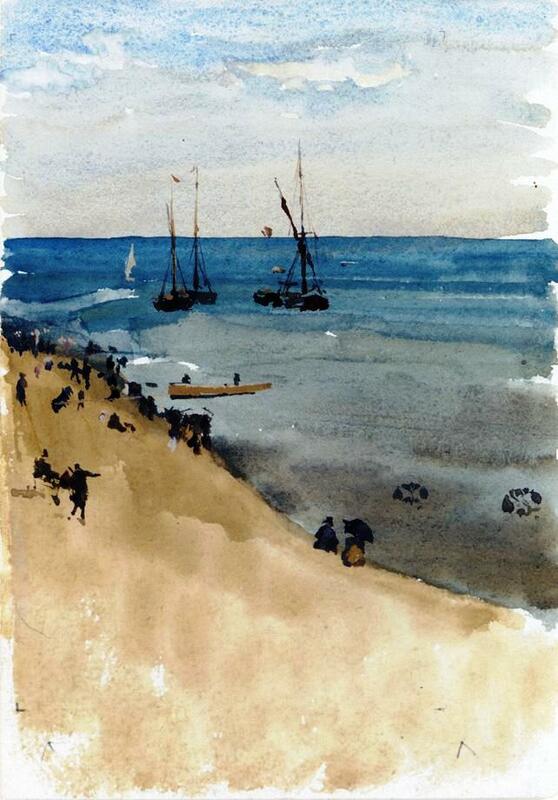 John Ruskin therefore criticized American, but London-based artist James McNeill Whistler stating that Whistler was a “coxcomb” who “asked two hundred guineas for flinging a pot of paint in the public’s face.” (See James Abbott McNeil Whistler, Wikipedia.) 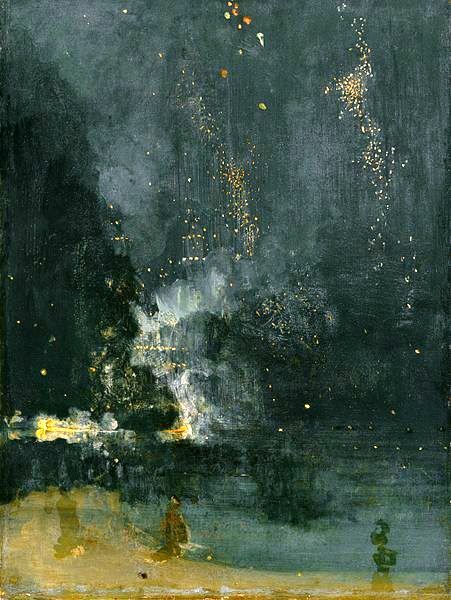 Such was John Ruskin’s description of Whistler’s “Nocture in Black and Gold, the Falling Rocket”. Whistler sued and won, but he had to declare bankruptcy and lost the “White House” designed for him by Arthur William Godwin, the cabinet-maker who created the “sideboard” shown above. Yet if the Pre-Raphaelites are to be linked to another 19th-century British art movement, it would be the art for art’s sake Aesthetic Movement which paralleled, albeit to a lesser extent, the decadence of French poets and artists of the second half of 19th-century. French poets were drinking absinthe, which contained an hallucinogen, thujone. For his part, Dante Gabriel Rossetti took chloral. Although James McNeill Whistler introduced Dante Gabriel Rossetti to Japonism in 1860, the Pre-Raphaelite Brotherhood is not related to Japonism. It remains however that if the Aesthetic movement could accommodate “Ruskinian Gothic,” not to mention the medievalism of such devotees as William Morris and Sir Edward Burne-Jones, one wonders why it would reject Ruskinian “truth to nature”. Arthur William Godwin‘s “sideboard” is in the Anglo-Japanese style, which, as is the case with all the movements listed above, is a forerunner of Aestheticism. As an architect-designer, Godwin, who designed the desk displayed above, also drew his inspiration from “Ruskinian Gothic”. Although exotic Japonism helped shape the art of 19th-century Britain, the stained-glass pieces of Sir Edward Burne-Jones (28 August 1833 – 17 June 1898) reached into the Medieval era, as did Arthur William Godwin’s gothic Northampton Guildhall. Morris and Burne-Jones met as students at Oxford and both were attracted to the Middle Ages, or Gothic, praised by John Ruskin (8 February 1819 – 20 January 1900) who was not only the most prominent art historian and critic of the Victorian era, but also a fine artist. 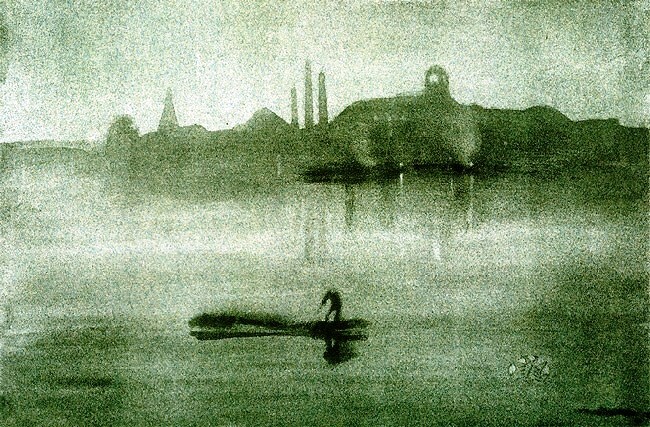 Whistler was one of the first to appreciate the true significance of the Japanese prints which had begun to appear in the West after Japan’s centuries of isolation ended in the 1850s, and to see that such works, whose subject matter was generally unknown or without much meaning even when it was ascertainable, forced people to think and to see entirely in terms of pictorial qualities, of line and pattern and color; to adapt them as demonstrations of the principle that Reality in painting is intrinsic, not a matter of copying anything outside itself. Japonism, however, would characterize the art of American but London-based James McNeill Whistler and American impressionist William Merritt Chase (1 November 1849 – 25 October 1916). Their Japonism is one of subject matter mainly, but exotic subject matter depicted in the rather allusive manner of Impressionism. Both showed blue and white porcelain, fans, screens and ladies wearing kimonos that displayed an oriental motif. “The Blue Kimono,” featured below, is one of the finest paintings created by William Merritt Chase. Ironically, it could be said of both Whistler and Chase that their Japonism was of a decorative nature. The rooms they showed became fashionable and so did the clothes worn by the ladies they portrayed. Whistler’s “Peacock Room” is not altogether consistent with the domestication of the arts advocated by the Arts and Crafts Movement, founded by William Morris. Whistler’s “Peacock Room” is a room, but it borders on art for art’s sake. It was designed in the Anglo-Japanese style and is housed in the Freer Gallery of Art, in Washington D.C..
Anglo-Japanese Style was applied to cabinet-making. However, the 19th-century British art movement we tend to associate with interior design and the decorative arts is the Arts and Crafts Movement, founded by William Morris (24 March 1834 – 3 October 1896). The Arts and Crafts Movement will be discussed in a separate post, but we have already witnessed a certain domestication of the art and a broadening of the field of art. Henceforth, it will include applied arts and such artists as William Morris and Sir Edward Burne-Jones will be extremely versatile. 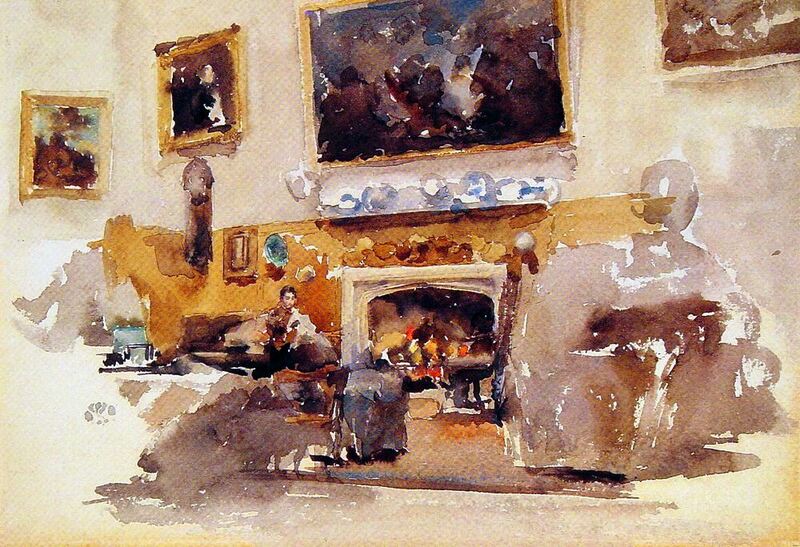 Whistler, who designed the luxurious “Peacock Room” and sued revered Ruskin, was an interior designer, a painter, and a printmaker. Timothy Hilton, The Pre-Raphaelites (Oxford University Press, 1970), p. 46. They would be joined by painters James Collinson and Frederic George Stephens, Rossetti’s brother, poet and critic William Michael Rossetti, and sculptor Thomas Woolner, Sir Edward Burne-Jones, and John William Waterhouse. Alan Gowans, The Restless Art: a History of Painters and Painting 1760-1960 (Philadelphia and New York: J. B. Lippincott Company, 1966), p. 237. Look at this beautiful room. There are flowers on the windowsill. A young girl is watering the flowers. To the left, we find the essential day bed. The carpeting seems hand-woven and is almost identical to French-Canadian “catalognes.” The wooden floor is made of wide planks. They were still available in those days. The little stage is just right for children and makes a delightful side table for the person lying on the day bed. The furniture is colored and the day bed, covered with striped fabric: blue stripes. In my eyes, Carlsson’s paintings of his family and home are his masterpieces. I love the details suggesting the daily life of a family. For instance, I see the little white cat in the kitchen, the wool on a small dining-table, a young pianist at the piano. Carl and Karin Larsson loved their home and made it their jewell. They made it Ett Hem (A home). Carl Larsson (May 28, 1853 – January 22, 1919) was born in Stockholm to a very poor family. But his artistic talents were recognized in time for him to be trained at the “principskola” of the Royal Swedish Academy of Arts where success as a student gave him confidence and led to employment. For instance, he was, among other things, an illustrator. 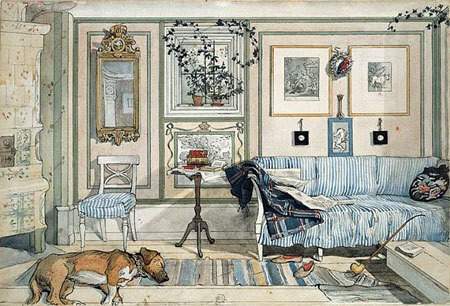 Working as an illustrator left an imprint on Carl Larsson’s art. Many artists do not let us see the sketch, or the lines, from which emerges the finished work of art. But Larsson leaves in the lines which links him to the Arts and Crafts Movement. The Arts and Crafts Movement, a mainly British movement, included such artists as Walter Crane, an illustrator. Its membership also included the very prominent William Morris, its chief member. The Arts and Crafts Movement is sometimes associated with Pre-Raphaelite artists such as Dante Gabriel Rossetti, Sir Edward Burne-Jones, John Ruskin, an artist and theorist, except that the Pre-Raphaelites went beyond realism. They reached for a utopia. 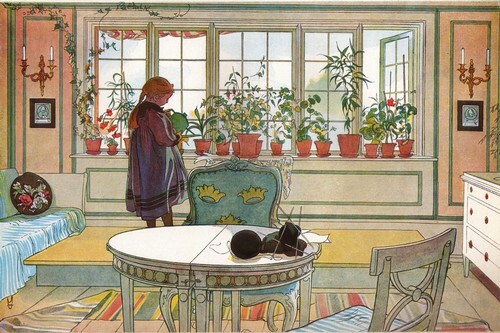 As for Carl Larsson’s art, it is representational but very much alive. In fact, it constitutes a compelling chronicle of a dream come true: a home! It is neither right nor wrong to show the sketches from which a painting emerges. Carl Larrson’s does so in a discreet manner and to the advantage of his art. It is characterized by definition, definition in its most fundamental acceptation. This style may be a matter of temperament, but it could also be a matter of choice. Larsson’s art also reflects exposure to the Barbizon School, a French movement particularly well represented by Jean-Baptiste-Camille Corot. In fact, having spent two years with the ‘plein-air’ Barbizon disciples, Larsson founded a colony of Swedish artists working in France. Among members of the group was Karin Bergöö, an artist and Carl Larsson’s future wife. She and Carl had eight children. When he met and married Karin, Larsson left behind abject poverty to enter a world that gave him not a castle but the home he had not had as a child and which would be home not only to his family, but also to those among us who, as I have already expressed, require an occasional refuge. Lilla Hyttnäs is both alive and livable. 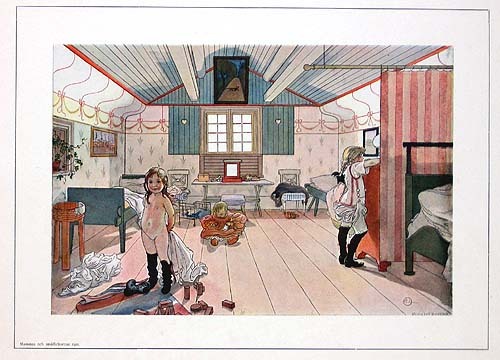 There is so much to say about Carl Larsson, but let the images speak for themselves. 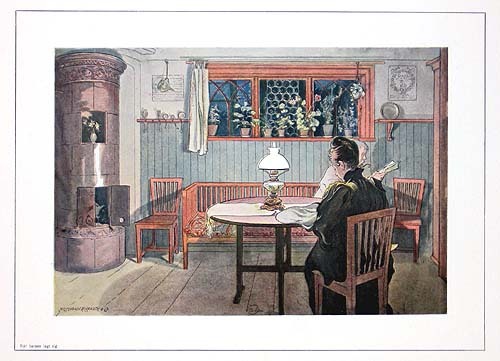 I will confine this blog to Carl Larsson’s paintings of Lilla Hyttnäs, in Sundborn, a house given to Karin and Carl by Karin’s father and which expresses the very essence of home. While I was here, I experienced an indescribably delightful feeling of seclusion from the hustle and bustle of the world, which I have only experienced once before (and that was in a village in the French countryside). Carl Larsson was influenced by other artists only to become one of the most influential artists of his time and ours. 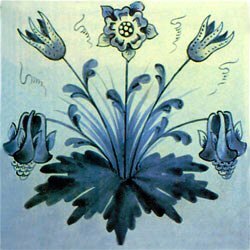 Yesterday, I decorated an appreciation post by inserting a picture of one tile, William Morris‘s Columbine Tile. So let me now honour its creator: William Morris (24 March 1834 – 3 October 1896). I found a picture of this tile on a website you can access by clicking on William Morris. Moreover, the tile is on the market. William Morris is remembered mainly as a textile designer. I became acquainted with his work when I visited the Metropolitan Music of Art, in New York. But my interest grew when I realized that he was the illustrator of the 1896 Kelmscott Press edition of the Works of Geoffrey Chaucer (c. 1343 – 25 October 1400). Morris’s illustrations are reminiscent of illuminated medieval books, books enhanced by enluminures or illuminations are now prized chiefly because of their fine calligraphy and their enluminures. As I noted a few days ago, we remember John Amos Comenius because he published the first illustrated textbook. However, let us return to William Morris to tell that he was also a writer. Among other works, he wrote News from Nowhere (1890), a book considered as utopian. He was also a predecessor to J. R. R. Tolkien, C. S. Lewis and J. K. Rowling, in that he published a fantasy novel entitled The Well at the World’s End (1896). Pre-Raphaelites championed the art of Michelangelo and, particularly, the paintings of Raphael, or Raffaello Sanzio da Urbino (6 April or 28 March 1483 – 6 April 1529), not to mention Leonardo da Vinci. So here we are once again at the Renaissance court of Urbino, the court where Castiglione observed courtly behaviour. Il Libro del Cortegiano (The Book of the Courtier), published in Venice in 1528, is a description of courtly life as Castiglione knew it from his long stay at the court of Urbino. The Louvre houses Raphael’s portrait of Castiglione. As for the Arts and Crafts Movement, William Morris founded the Movement. He had been inspired by the writings of John Ruskin (1819–1900), the foremost art critic of his time. Members of the Movement were traditionalists and advocates of fine design and decoration, values often belittled by artists whose works require a neutral background in order to be best shown. Beauty is everywhere, including in the manner one sets food on a plate. William Morris is also associated with Sir Edward Burne-Jones (28 August 1833 – 17 June 1898), a friend and a business partner. Sir Edward Burne-Jones’s paintings can be mistaken for medieval works. The tile I have shown is a classic on the art of gradation. The design is dark at the very bottom, which sits it, so to speak, and then, as we near the top, the blues mutate progressively to lighter and nuanced shades of blue.